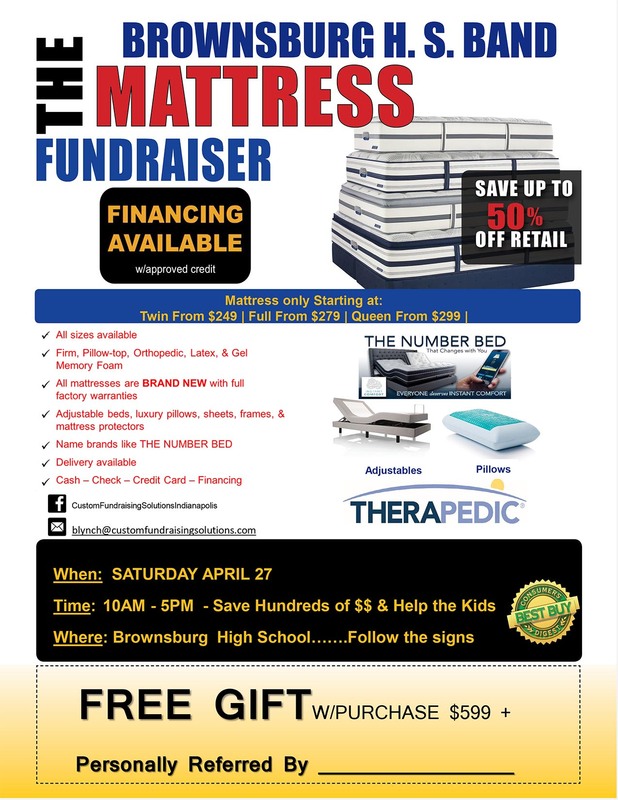 The Brownsburg Band and Orchestra is hosting a Mattress Sale Fundraiser again this year, and we are once again partnering with Custom Fundraising Solutions for this event. Last year’s event was a great success and we’re hoping to beat last year’s results! If you’re in need of a new mattress, here’s your chance to get great deal – saving up to 50% off retail – and support the your Brownsburg Band students. A percentage of each sale goes to the Brownsburg Band and Orchestra programs. Plus, if you list the name of a referring band student on your flyer, that student will receive a portion of the sale toward their band fees for next year. Download and print the flyer here. You must bring the flyer with the student’s name on it for them to receive credit. The Brownsburg High School Gym will be transformed into mattress showroom. There will be model beds on site for you to try and expert staff on hand to answer your questions. All styes – Pillow top, Firm, Plush, Orthopedic, Memory Foam and more! Custom Fundraising Solutions is dedicated to helping schools and communities generate revenue for important programs. To date, they have given back over $40 million dollars to groups & youth organizations all over the country.